By LUDWIG VON KOOPA - Their goal isn't success. (I don't recommend you watch that, by the way.) When you're declaring war or trying to do any sort of movement against something, you want to have a goal. You need a win condition. You need a retreat condition, and you need strategy and tactics. You need a purpose. The organizers, if you can call them that, of the Miiverse "war" do not understand these basic principles. I do. So I'll try to do some last-minute advising. Probably a bit worse of a commitment than the military advisers President Barack Hussein Obama is sending over to Iraq, but whatever. Speaking of Iraq, President George W. Bush didn't understand how to execute a war, either. His father also didn't, despite the spectacular glory we had in Desert Storm. So don't feel bad Miiverse guys! You're just as bad as the warmonger presidents we've had since Vietnam, who were also terrible! Let's start with an example of a campaign. One of the things KoopaTV wants to do is to get Nintendo to change their eShop policy. Since Nintendo incorporated Nintendo Network IDs into their eShop framework, it restricts underage users from being able to buy videogames with a higher ESRB rating... even if their parents are fine with the purchase. It's an unnecessary move on Nintendo's part, and it only hampers sales without benefit. Goal: Get the policy changed. Win condition? When that is achieved. When do we retreat? We don't. It's not like we'll get killed for advocating this. That doesn't apply to every campaign, of course. By coincidence, this infographic has the Iraq War as an example. The strategy is to raise awareness of the issue and convince the movers and shakers to take action on it. The tactics were to write articles and advertise the issue so all the facts are out there. Based on the many sad 16-year olds or whatever on Miiverse and other places that can't buy Phoenix Wright: Ace Attorney - Dual Destinies, the support for KoopaTV's campaign is there. When people are educated on the issue and know what they can do, we can take appropriate action. That action included sending messages to Nintendo and affected developers to let them know about the issue. Nintendo might not have even known this was a problem when they were designing the eShop, after all. By comparison, let's look at these Miiverse protestors. Their purpose is to... do something, because Nintendo bans them for breaking the rules and being stupid people. So they're mad. We all know my own experience of being banned from Miiverse, but I didn't make a war about it. I just made two articles and a clever post upon returning. 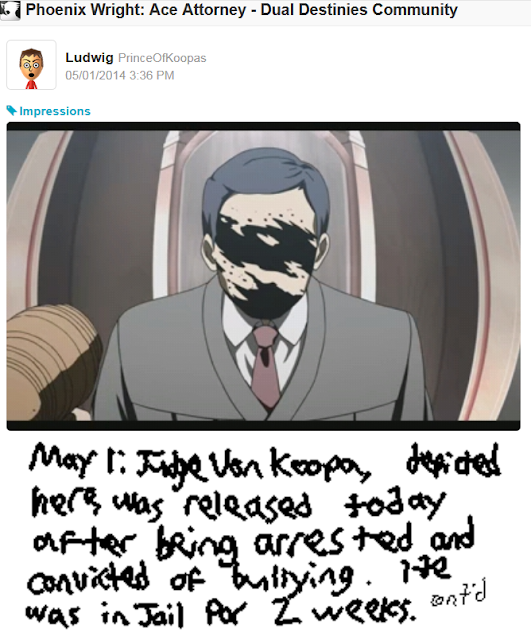 Judge Von Koopa was sentenced to a 2-week ban. These guys are mad that "popular" users were "false-reported." According to Nintendo, they look at everything by a human. So... deleted things must have a good reason! Anyway, no one really seems to know what their plan is. Reasonable people deride these protestors. And their entire discussion on this is centered just in the YouTube and Super Smash Bros. series community. It's like how liberals think the only parts of America are the two coasts. (You can read a rant on coastal elitists here.) These guys think the entirety of Miiverse is just those two places. If they want a Miiverse-wide protest, then what they should've done, since they announced this weeks in advance, was to send emissaries to all the other Miiverse communities. And not just tell them what's going on, how to join in, and what their cause is... in clear terms, mind you, but they should have then STUCK AROUND for the duration and integrate themselves into the community. Those are the kinds of tactics that the Obama presidential election campaign pretty much perfected in 2008 and then again in 2012. You don't make your outreach campaign look like a bunch of carpetbaggers: You dedicate yourselves to that community. I've seen no such dedication on the part of these protestors. They still haven't outlined what exactly they plan to do! Their planning is so janky and disorganized no one can keep up with it, and I'm actually trying to get information on these guys. The majority of Miiverse isn't looking for this information and are just going about on their day discussing... something. It's hard to inspire people to join your cause when your outreach is horrible and you are either too incompetent to explain yourself or you like the idea of being mysterious or surprising. The mysterious dude in the corner is a cool image that some want to aspire to, but you don't do it if you're trying to raise awareness. So what will happen tomorrow? You know, I don't know. Do you know? But it'll probably be a treat to observe. Or horrible. Obviously Nintendo isn't aware about it or else they wouldn't implement a line-break feature today! Well, if I were the organizers, I would call off the thing. But is it even organized enough to call it off? Is it too late? Is it like Occupy Wall Street and Nintendo Redirect? Still, not everything without a central figurehead is bound to go to disaster. Look at /v/! ...Except Miiverse fighting against Nintendo, who operates Miiverse, is quite a bit different than making a thank-you card. Yeah, nevermind. This is doomed. 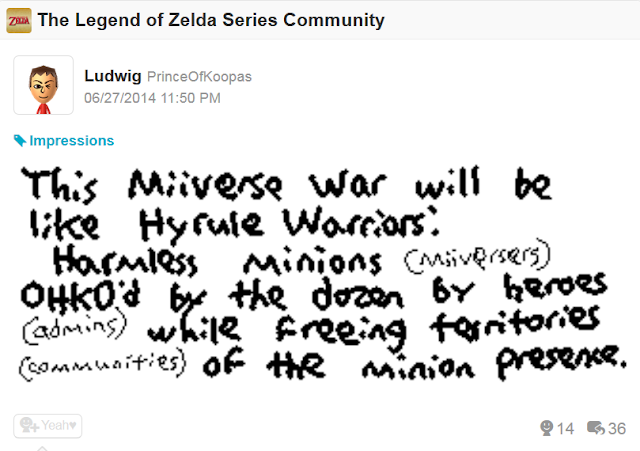 I'm equating the Miiverse War to Hyrule Warriors. Maybe that also means it'll be boring. Ludwig is a Miiverse user himself. He thinks his own ban was unjustified, but it's not like him being banned from places is anything new. His NNID is PrinceOfKoopas. Fun fact: He hasn't gotten in trouble with the moderation since his ban! Ludwig got banned a second time, but he didn't start a war. He just cried. "even if their parents are fine with the purchase"
" Phoenix Wright: Ace Attorney - Dual Destinies"
If this is any objection(Okay, pun not intended) to the Rating of AADD, then let me ask you something. Have you EVER played a single Ace Attorney game in all it's glory? What happened to the one today? Smash community looks the same as any other day.